Heat up the wintry cold! Known for manufacturing some of the world’s most famous barbecue and hot sauces, Original Juan Specialty Food offers anything from salsas and marinades to colorful pottery and serving dishes. 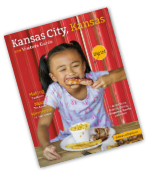 Gift baskets offering Kansas City’s best barbecue sauces are also available! While the products from KC Soda Co. come from all over the world, they can only be found sold together in one place in Kansas City, KS! Create your own pack and choose from 1,3000 flavors of your favorite fizzy beverage including: Maple Cream, Pumpkin Spice and Aronia Berry. Krizman&apos;s Sausage is a family-owned meat market that has been serving Kansas City for more than 75 years. Pick up the freshest ethnic sausages and rubs to add to your holiday party. Polish sausage and house made sauerkraut are staples for those who frequent Krizman’s, while blood sausage remains a delicacy for the adventurous. For the quirkiest of your friends and family, Moon Marble Co. in Bonner Springs,KS is the place to go! Hunt the bright and colorful store and marble making factory for vintage toys and games, glass-blown art and marbles galore. Sideline Chic also located in Bonner Springs. Shop the boutique for cute and cozy sweatshirts and other active wear featuring your favorite Kansas City teams. Sport Nutz in Legends Outlets Kansas City is also perfect stop for any Kansas City sports fan, featuring branded apparel, jerseys, and memorabilia. 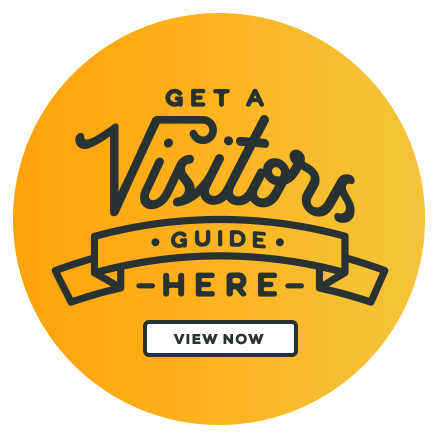 Sav-Art, A Simple Gallery is unlike anything else you can find in Kansas City. 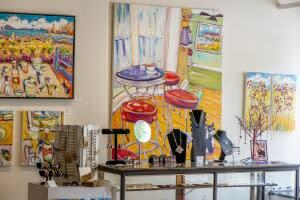 The gift shop and art gallery features locally-made jewelry, paintings, and other works of art. Gallery owner Mike Savage, whose work is featured here as well, is known for his colorful depictions of iconic Kansas City and Midwest scenery. A Cup on the Hill is much more than a stop for your morning cup of joe. The local coffee shop is known for showcasing handmade pottery, jewelry and other goods from artists in the Kansas City area. Here you can also grab bags of “Cup” favorites including the Firehouse Blend and Snickerdoodle coffee. 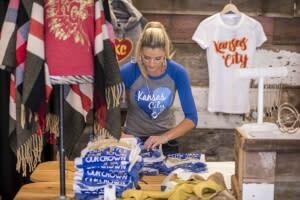 Made in KC is a pop-up store coming to Kansas City, KS just in time for the holiday season! Located in Legends Outlets Kansas City, the store will sell items ranging from apparel and accessories to home goods and artwork – all made by local talent. Made in KC opens November 17th and will only be at this location for a limited time.